By Alexis Leon & C.K.Thomas, Comdex Computer Publishing, 1996. The Indian Software industry is one of the fastest growing industrial sectors of the economy, second only to the financial services sector. Today, Indian software industry employees 1.3 lakh people and this figure is expected to grow up at an exponential rate in the coming years. From modest beginnings in the early 1980s, the Indian software industry has grown leaps and bounds over the last decade. Today, it boasts a turnover of over Rs.3750 crores. The growth of the Industry has been largely export-led. Software exports from India, zoomed from a mere $24 million in 1985 to $470 millions in 1994-95 and the figure is projected to go up to $1 billion in 1997-98 and 12 Billion dollars by year 2000. Even though there is high growth rate in the software industry during the past decade, India’s contribution to the world software market is still not very substantial. With its vast untapped potential, India is favourably placed to cash in on the exploding global demand for software and related services. With liberalization, the number of Multi-national companies desiring to set up a base in India is increasing day by day, which is evident from the numerous joint ventures that are being started. Major Multi-national companies like IBM, AT&T, Novell, Microsoft, Oracle, Sybase, Unisys, Texas Instruments, HP, and Digital have started their development centers in India, and are deriving their competitive edge from this centers. Today, India has the second largest English-speaking scientific manpower, next only to the United States. It also has a large network of technical institutions that train some 50,000 people annually. But still the software industry is acutely short of manpower. Lack of software professionals with the right qualifications and skills is one of the main reasons for this shortage. Even though there are hundreds of training institutions, only a few of them are imparting quality training which will get the students a good job. All others are just giving some training without the necessary infrastructure facilities or qualified instructors. For a person who does not have any knowledge of the IT industry, it is very difficult to chart his career path or to decide on which institution to join or what course to take. Often he or she is misled by the glamour and glory of the advertisements and will finally end up with a diploma or certificate which will neither fetch a job nor would provide any substantial learning. You are a 10+2 student and aim to become part of IT industry because you love computers, because you love to learn the latest technology and don’t want to be a mere clerk and want to earn and lead a comfortable life. You have taken a diploma from some reputed computer training institution after your college education and you are faced with a question how to get a job. Even though most of the training institutions promise placement after the completion of the course, it rarely happens so - you are left to fend for yourself. You have joined some small software company, there are thousands of them, after getting some experience, it is time to move forward into the big league. It is time to get a job with some multi-national company, and advance your career. But you don’t know which is the right company and how t o get there. You are a student counsellor in an Institute, or you are a computer teacher and is genuinely interested in the development of students. You wish to guide them to a successful career in Software profession. You are looking for a good book that gives everything in a nutshell. You are a software professional who have gained good experience in your respective application areas. The next logical step is going abroad. Even though there are a handful of ‘body shoppers’ or recruiting agencies operating in India, choosing the right one from them is a difficult decision. You will have to send in your resumes, fix a deal with the body shopper, will have to attend client interviews, both direct and telephonic, and have to overcome a lot of other hurdles before boarding the plane. If you belong to any of the categories mentioned above, then this book is for you. 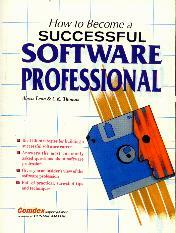 This is a practical guide to become successful in the software profession. It starts from the very beginning and tells you all the things that you wanted to know about the IT profession. The book gives detailed information and practical tips on how to prepare your resume/bio-data, how to prepare for an interview, how to prepare for the aptitude test, how to perform well in group discussions, how to attend telephonic interviews, how to impress your prospective employers, etc. It also contains sure shot and time tested methods of getting the job you want. Also included in the book is the list of Software companies in India and overseas recruiting agencies to which you can apply, their requirements and expectations, selection procedures, etc., which will give you a cutting edge over the others. ‘Forewarned is forearmed’. The book contains the details of the major Software training institutions in India, the courses offered by them and advise on which courses you should take and which institute you should join. Thus, this is a book for the novice as well as the experienced.